Forgot to mention in my last post that Wilson is performing amazingly for me also! Read my previous posts. Go sign Andrea Belotti from Torino if you have the funds. You won't have to worry about the striker position ever again. I know - but Man Utd signed him at the start of my save unfort so he is not an option. He is actually unhappy there now and transfer listed. I tried to be cheeky and put in a bid but they are having none of it!! That's funny because in my save Man Utd wanted Belotti, I signed him, and then they signed Icardi. Then Icardi went and broke his leg and missed most of the season! Dybala is always an option but he costs an astronomical amount. But if you can't get Belotti or Icardi, go for it. You gotta get a good striker in. Sturridge falls off fast, and he's injured half the time. 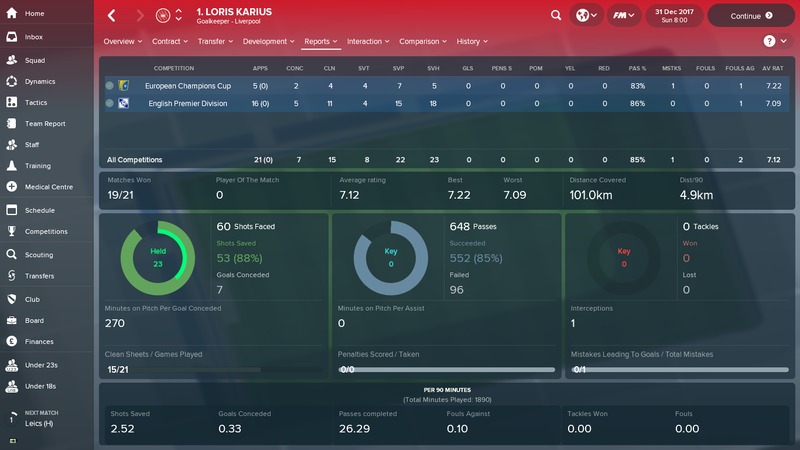 I signed Kasper Dolberg my first season and he's now the backup to Belotti, but is easily good enough to start. It's just that Belotti is performing out of his mind. You can't trust Woodburn and Solanke, no matter how talented they are, to win titles right now. They still need a few years of developing. At least in my experience. GK wise I still have MIgnolet but I signed Predrag Rajkovic in my first season. I played Mings almost entirely the first season, letting Rajkovic play in cup games. My second season in I've let Rajkovic slowly become the starter over Mings and he now is in second place in the league for shutouts. He's worth a look at. You can always go big and get Donnarumma or Oblak, too. Belotti is usually picked up by Chelsea and he is goal machine. always scores against me. Dybala is a great addition, but he is almost certainly sold by the end of first season and after that almost impossible to buy him. You can declare an interest and wait for around couple months to unsettle him, and you can get fee lowered but his wages and agent fees do cost an arm and a leg. But, he is worth the trouble. Icardi, you can pick him up cheap at first summer window. He is a beast and works very well with Dybala. The problem is these players are either first year signings or never. so you have to make plans for players getting sold and etc, earlier to make funds for them. 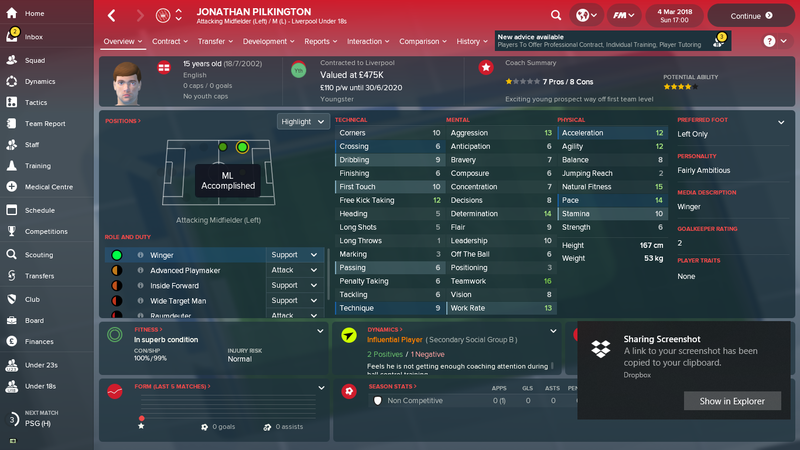 Bought him in summer of 2021 and he has scored 26 goals in 16 games. Lad is unreal.. He did cost me £82m though but had £240m in budget after selling some deadwood. When you are going for your first bid on a player, most of the time they want a %. Remove and exclude them both. The standard one is the % on the profit, exclude and remove that one and than select the % on the selling price and remove and exclude it. This increases the Fee upfront though, so it's up to you. 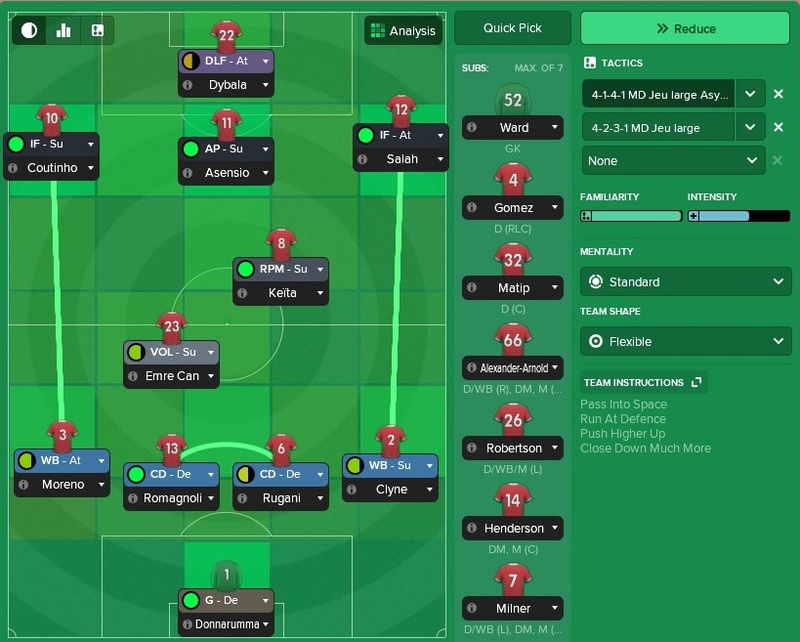 My first chance at playing this years game and had a great season with Liverpool just signing the 3 players Dolberg, Van Dijk and De ligt, been breaking records and won the treble. 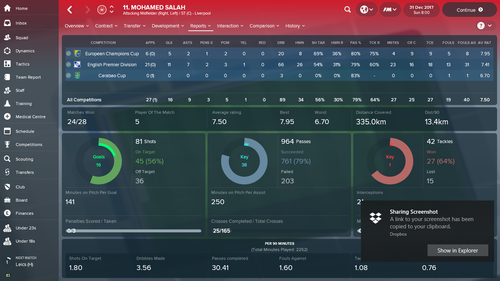 Salah was on fire with 33 goals in 39 matches. 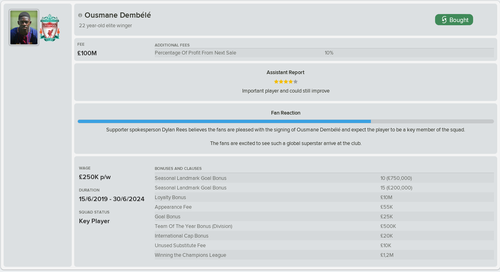 A big issue I have is all my players are now asking for new contracts. I bought Van Dijk first window and at the end of the season he's unhappy now because i won't double his wage. 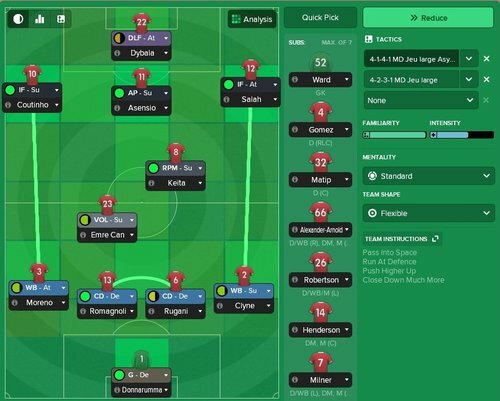 All my first teamers want £250k plus, my squad players want £100k plus. Salah now wants £300k a week. Im quite a prudent manager and well im not liking this years wage hike demands even though Henderson is doing a great job talking 90% of them around!! I finally finished my second season. For those who have been following along with my updates, here's the final one for this season. We won the PL going 31-5-2, scoring 98 points and thus setting a new record for wins and points in a season. We were first in goals scored with 122! and first in goals allowed with 35. Man U finished 2nd place with 79 points. The top six were Liverpool, Man U, Arsenal, Tottenham, Man City, and Chelsea. Brentford (quite possibly one of the worst teams to make it to the PL ever), Stoke, and Wolves were relegated. Bournemouth were the surprise team, finishing 5th last season and 7th this season. They are really building a good program. Elsewhere we lost in CL semis against Juventus. Keita received a red card 12 minutes in to the first game of the series and there was no coming back from that. Juventus is now playing Leverkusen in the finals. Leverkusen!!! Leverkusen finished 5th in the Bundesliga but has made it to the finals of the CL. Unreal. We lost in the FA Cup Sixth Round to Arsenal, which was a huge let down after winning the FA Cup last season. Also lost in the Carabao Cup finals to Man City, but honestly who cares. Now on to the players. Coutinho won English Player of the Year and English Player's Player of the Year, making it back to back Liverpool players to win that award (Firmino won it last year.) Coutinho finished with 22 league goals and 22 league assists. Belotti won the Top Goalscorer Award as he ran away with the award with an incredible 36 league goals (new PL record) and a total of 55 goals! I bought him for $58 million before the season, easily my best signing this year and tied with De Ligt for my best signing over both seasons. Six of my players made the PL Best XI of the year. Clyne, De Ligt, Matip, Can, Coutinho and Belotti. In goal, Rajkovic set a new Liverpool record with a total of 17 shutouts. Basically if there was a record to be broken, we broke it this year. Entering the summer window I have $178 million in transfer room and that's before adding in to whatever amount I get for Emre Can. PSG are going to sign him. He wants to go there, I promised I'd let him, and they've publicly said he's their top target. So add another $85 million-ish to the budget. With Henderson, Goretzka, Keita, Isco, and Savic, I'm fine with letting him go. Any ideas on who to go after? I really don't have any glaring weakness. Anyways it was a wonderful season and besides not winning the CL I have no other complaints! 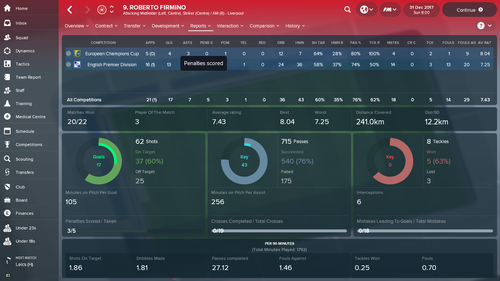 EDIT: I forgot to mention that prior to the season I loaned Ings out to Fiorentina and I was just notified he led Serie A in goals! Also loaned Rhian Brewster out to Crewe and he led the Sky Bet League 1 in goals. I have players winning awards all over the place. You can play the same team twice in 7 days, first game is EPL, you win 3-1 and do well. Second game is FA Cup, the exact same teams play, you get belted 5-0 and don't have a shot cause they play like Barcelona in their prime. 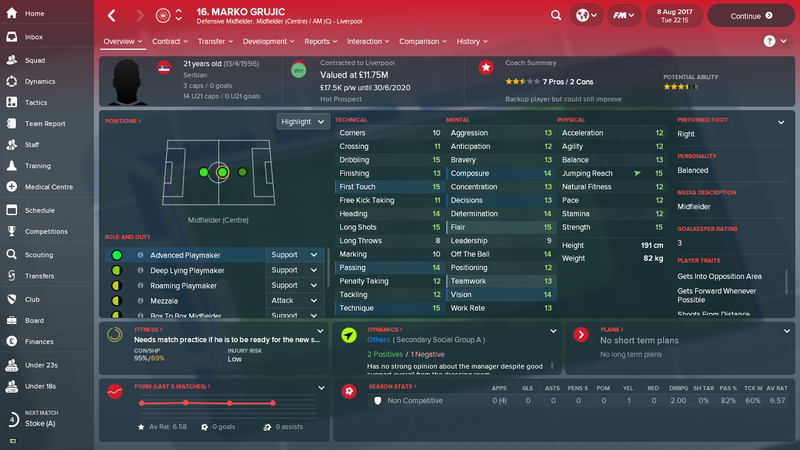 Grujic will be my long term replacement for Can. TAA will rotate with Gomez as Rb this season, but it's clear he'll be my main RB next year if everything goes the way I want it to. Mignolet £17.5m to Zenit. I've never rated the man IRL and in the game his stats aren't good enough to be playing for Liverpool. Grrr in 1 training session, Gomez does his cruciates and Salah and mane both broke their legs!!!!! 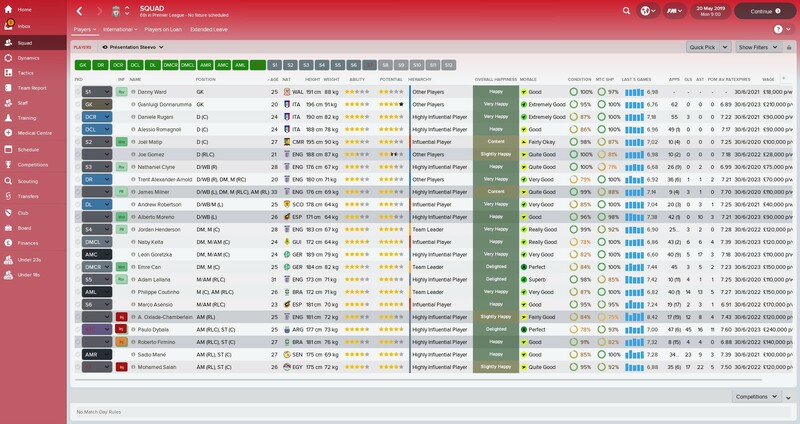 So after finishing my 2nd season I have a TON of money, around $180 million, in transfer budget. I don't have any real weaknesses but I just saw that Milan has transfer listed Donnarumma! I have no idea why. 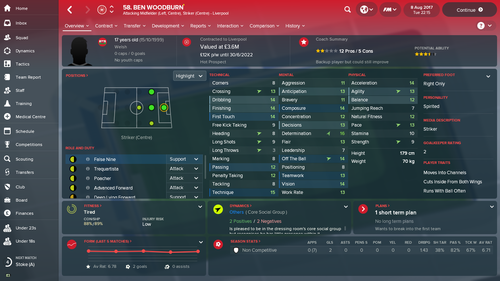 He's still listed as a "wonderkid" and has had two solid seasons. Milan finished 9th in Serie A so I guess that's the only reason why they listed him. He already had a reasonable release clause of $88 million but now he's listed for $42.5 million! I think I would stupid not to buy him. What do you guys think? 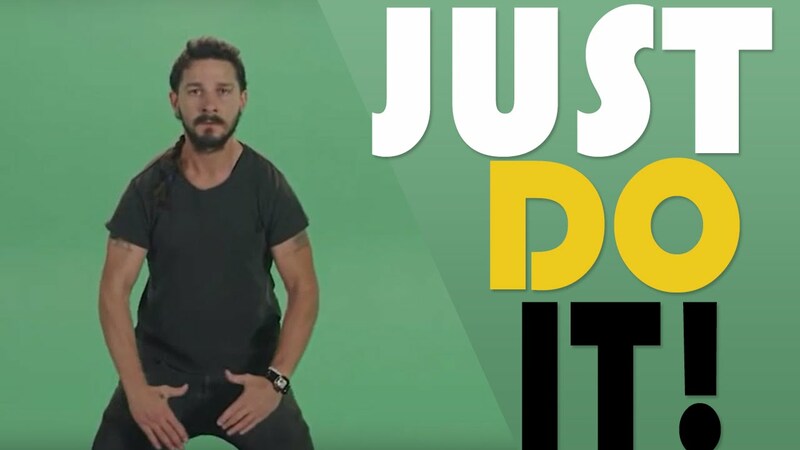 Just because of that, I'm doing it. Thank you! So I did it. Offered the transfer listed price of $42.5 million and they accepted. 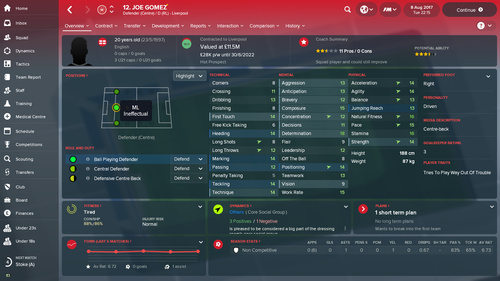 He wanted a ton of money in wages (highest on our team) but I'm willing to pay it. I have the room. 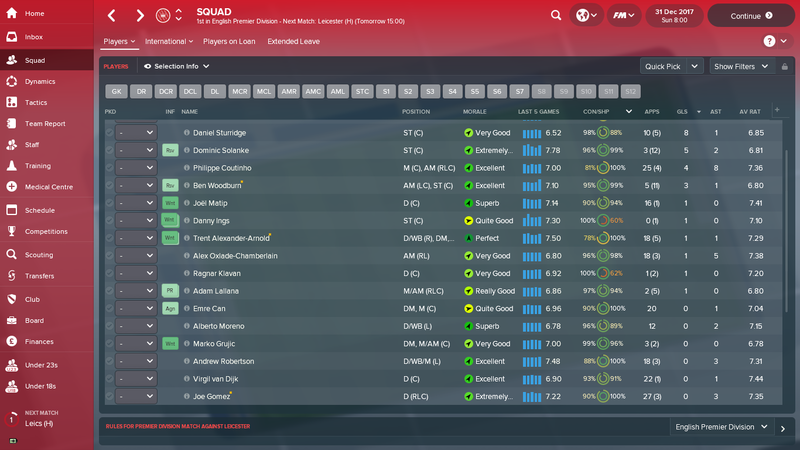 Now the issue is I have three GK who all are listed as First Team players. Mignolet, Rajkovic, and Donnarumma. Obviously I want Mignolet gone. 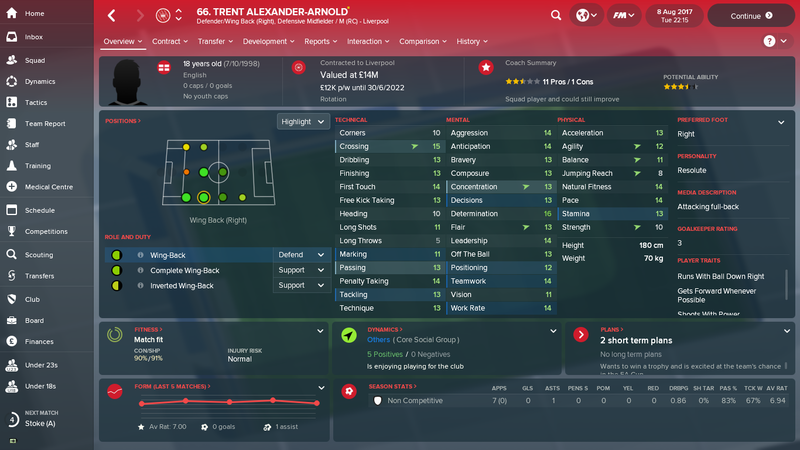 I'm going to go transfer listing him and hopefully someone bites. Otherwise I'll have to loan him out. Rajkovic played really well for us this past season, breaking the Liverpool record for most shutouts in a season. But the fact that Donnarumma is only 20 years old (Rajkovic is only 23, but still) and better in almost every attribute over Rajkovic made it a no brainer at the price Milan was willing to let him go for. In an ideal world, my third season will let Donnarumma and Rajkovic both play and I'll ride the hot hand. The other option is to keep Mignolet and Donnarumma and loan out Rajkovic. Overall, it's a good problem to have. I'd rather have more good players then less. Won the Champs League, beat City 3-0. 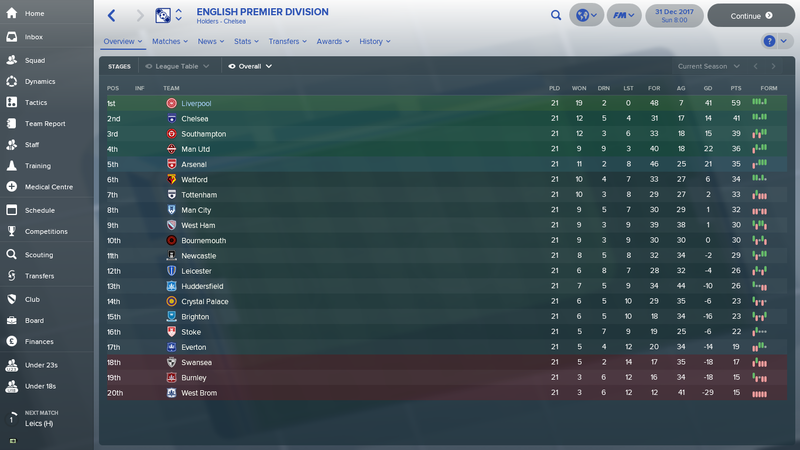 Well and truly FM'd City. They had 6 clear cut chances and I had 4 shots on target. Lost the League Cup, Chelsea FM'd me. Sanchez has agreed 200k a week on free at the end of season 1. Has anyone signed Ozil? His aggression and bravery put me off but for 150k a week on a free transfer. Markovic wants 100k. Has anyone signed Ozil, for which position and how did he do? 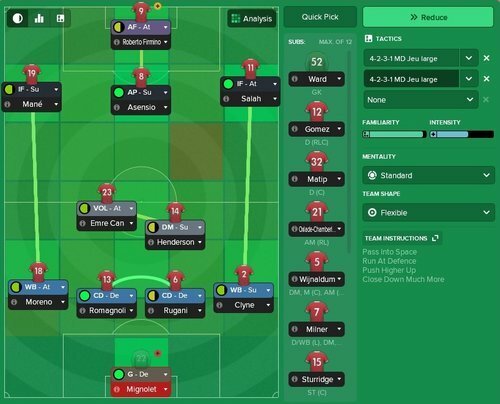 First of all, I took Liverpool because i wanna try a 4-2-3-1 and the team seems to have good wingers to play really with 2 players on the wing. So for my first season, my priority was to replace central defenders who doesn't seems really good, this is why i bought Rugani and Romagnoli to make a 100% italian defense. Bought Asensio in january because he was transfert listed, no regrets. 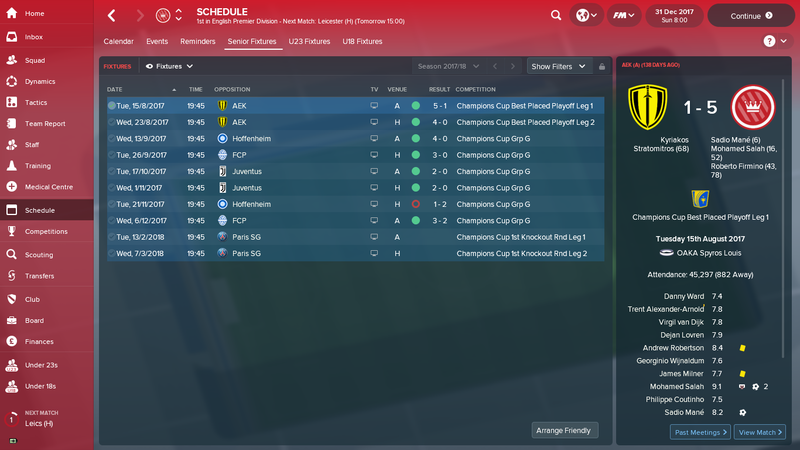 My results were pretty good, unfortunately knocked off group stage of champion's league but to win the europa league, seems fair. 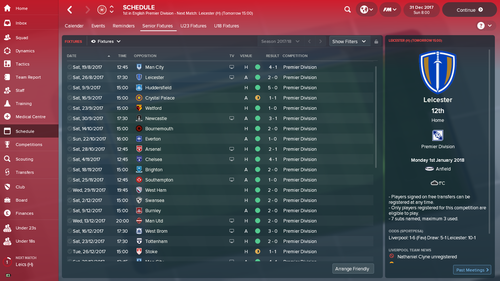 I made an incredible 14 wins in a row to come back in premier league to win behind Man United. All players did the job, Firmino, Salah and Coutinho was my key players but my defensive midfielders and defenders were pretty good too. 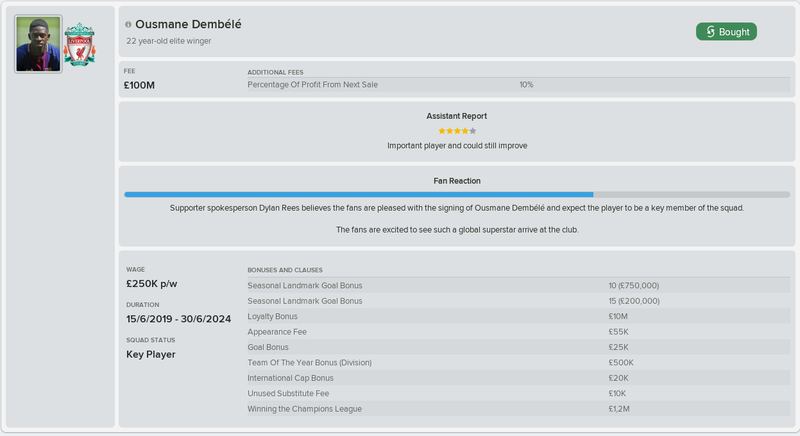 The benefits of a first season treble, Everyone wants your players. Napoli spending a combined £100mil on Mignolet and Moreno, Barcelona wanting Lallana for £45mil who barely kicked a ball for me, Madrid with a £96mil bid for Mane who was injured for half the season. Gonna try and not spend all the cash on superstars and let my rivals have them to keep the game interesting. Managed to resist Greizmann and Sanchez who are at United and City now. well maybe just the one, Dybala or Icardi? At the minute I just have Firmino, Dolberg and Woodburn as strikers having sold Sturridge and Ings and loaned out Solanke. 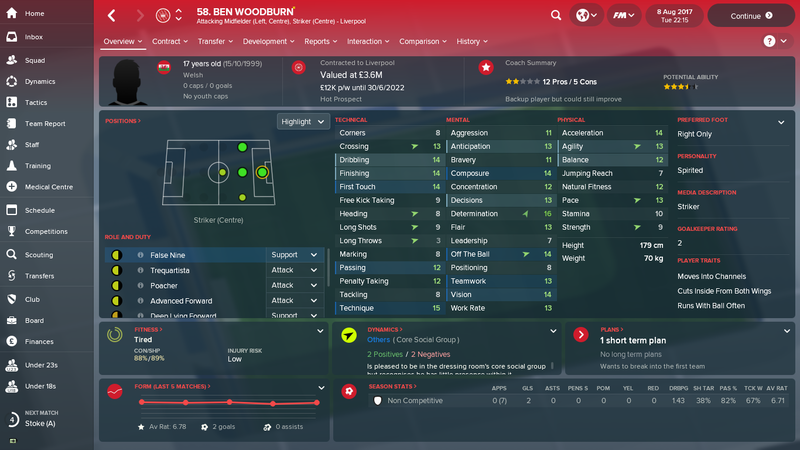 Thinking of training Wilson as a striker, him and Woodburn really produced for me first season. For my second season, i wasn't really original, i bought players like many buy + Goretzka who was available for free. I manage to sell some players for a really good price (Sturridge, Wijnaldum) and i don't have anymore money left. Dybala and Donnarumma wages are just insane compared to the rest of the team but i think they really worth it. I hope i'll have good results again. My board accepted to build a new stadium for 2020 (72 000 seated) so i'm really confident on the future. He's stole Buvac from me. 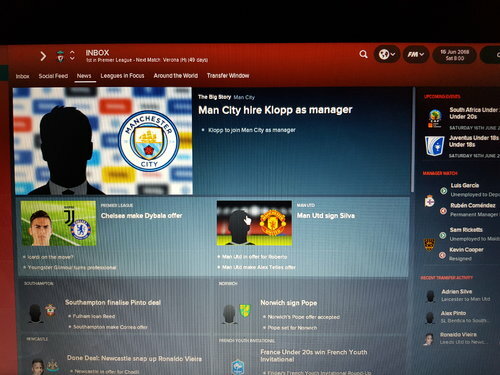 Anyone know a good assistant manager? Gerrard seems a little raw and maybe too early for him. Pref a good tactics coach. 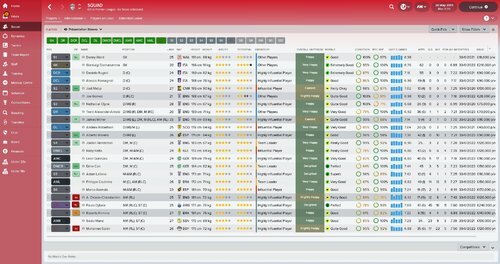 Klopp went to Arsenal in my save after Wenger retired and was immediately re-hired as general manager. Then Klopp took Buvac from me as well. I just went with Peter Kraweitz as my assistant manager. He's done fine for me. So I signed Donnarumma after he was transfer listed by Milan. Afterwards I changed Mignolet's status to Backup and surprisingly, nobody complained. 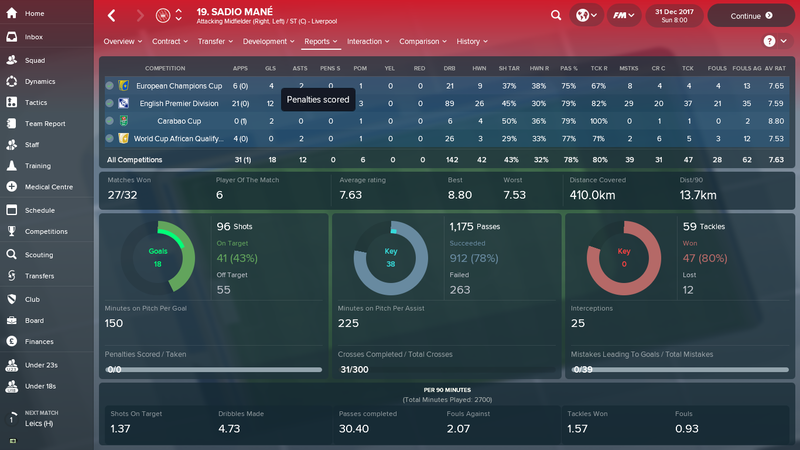 Also, in a surprising turn of events, Man U have offered Barca $117 million for Sadio Mane, just a season after I sold him to Barca. I looked at his stats and he had an alright season but didn't get the amount of playing time that he was getting with us at Liverpool (what a shock...). It'll definitely been interesting if he comes back to the PL for Man U. In other news, Belotti was absolutely ROBBED of the Europe Best Player award. He finished second for us despite having more goals, more assists, and a higher average rating then Messi, who won the award. Belotti did win the Europe Golden Shoe award though with 76 points. 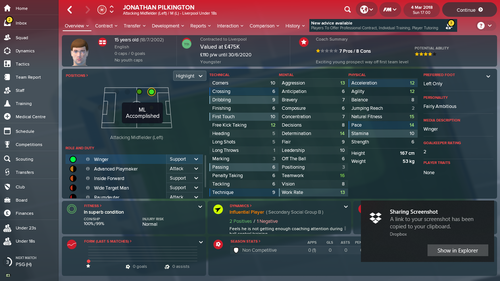 As someone mentioned in this thread a few posts back, the only downside to winning is everyone wants your players. Madrid wants Coutinho and Matip, PSG wants Firmino and Can, and various other teams are in the mix for some of our guys. I want to keep Coutinho above all so we'll see what happens. 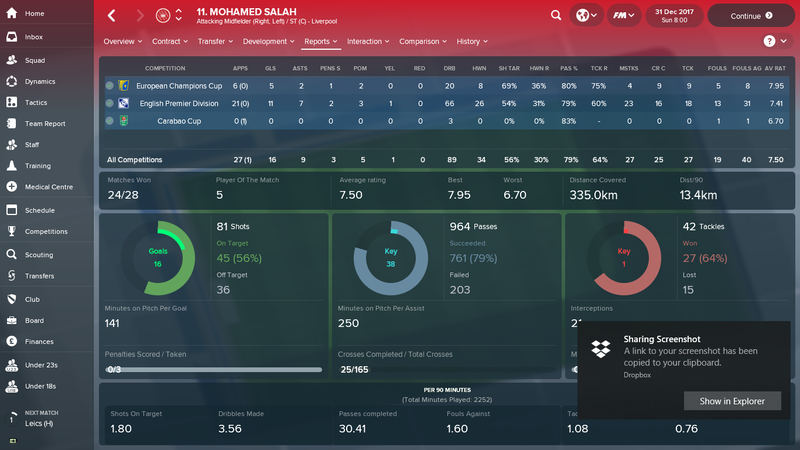 Yes the price is surprising, he didn't really have a good first season 10 apps + 14 subs for 7 golds (6.97 rathing), i was just lucky that City want him. But i couldn't sell Mignolet for a good price, even if he was the second best goalkeeper in premier league. 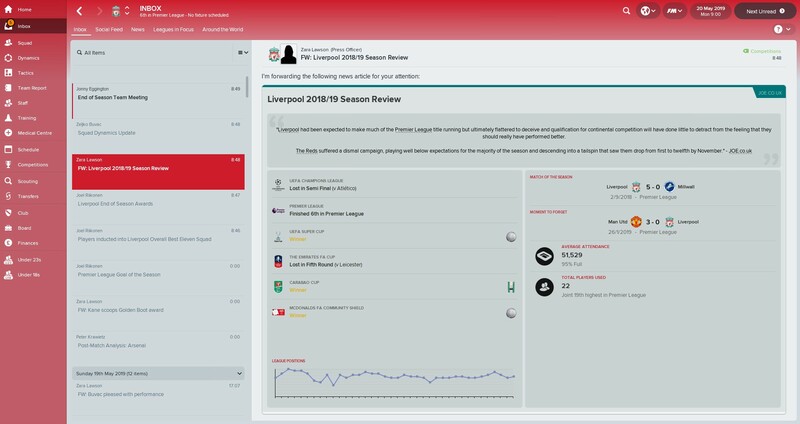 They all did well for me the first season. Eventually sold Mane and Salah but in the first year Firmino won almost every award possible. As I mentioned earlier in this thread, PSG wanted Emre Can bad. 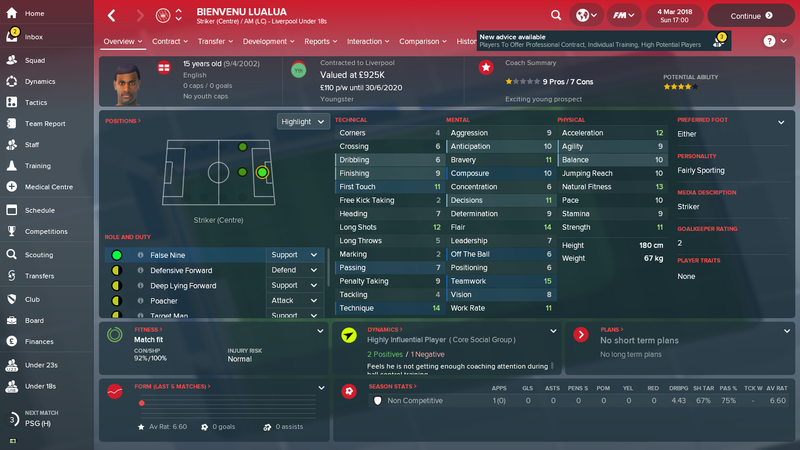 They declared him their top target, had Dani Alves campaign for him, and the head coach of PSG showed up to personally scout him numerous times. I promised Can I would accept any offer from PSG if the offer was at least $96 million. PSG must have an endless amount of money because I managed to sell Can to them for $125 million! That's more then I got for Mane and Salah. I can't fault PSG for wanting Can, he had an excellent season for us. I now have $238 million in transfer room and that's AFTER accounting for the Donnarumma purchase. 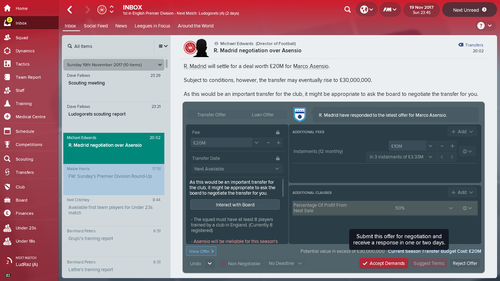 Has anyone got a problem when trying to sell players and they keep rejecting the other teams contract? nearly every person I try ends up rejecting. Anyone got a suggestion how to work this out? A couple of players rejected all loan deals out of the club. Their info screen said "Hoping to gain experience on loan" but never accepted a single offer. Do you know if they wanted new contracts? I've had players refuse loans until they get a new contract. The main reason was my defense which really underperformed, too much goals conceded. 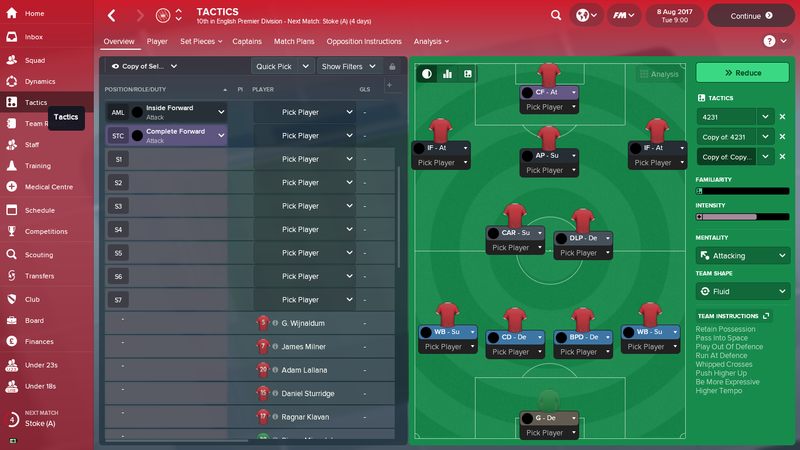 I switched to my first tactic during the season and it was better. Dybala was beast, really better than Firmino who is really slow. They had just signed new ones weeks before. In a separate save, Grulic has just rejected a 3rd loan move. He has a contract until 2021. I have noticed he is only being offered a rotation role. Maybe he would rather sit on my bench than Milans bench. 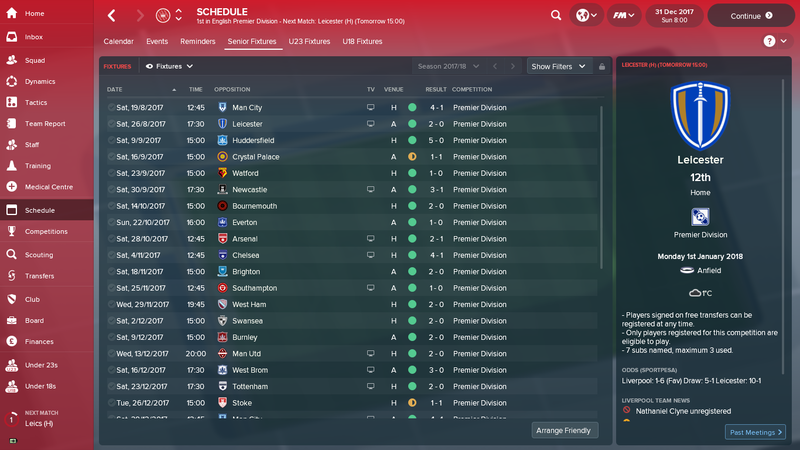 So I'm at January in my first season and things couldn't be going better, for me so far. 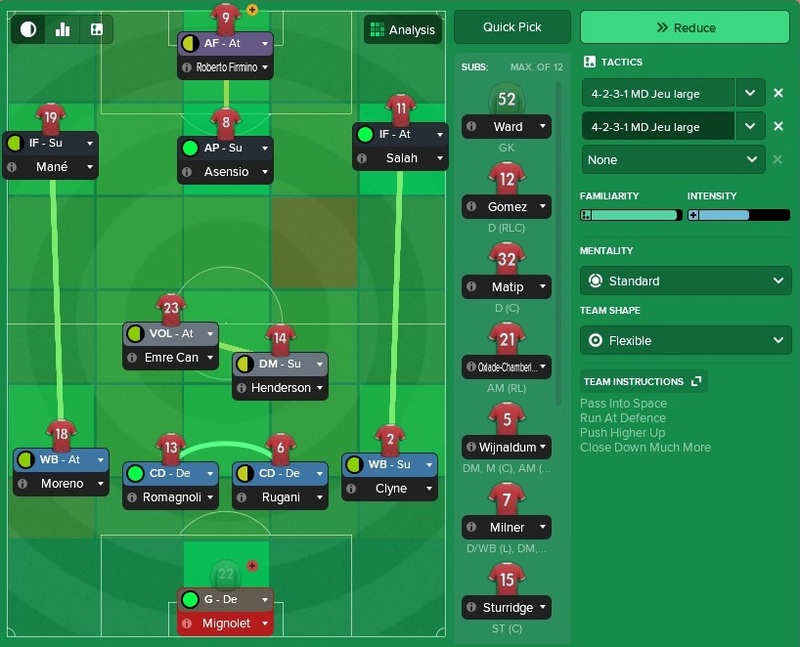 My 4-2-3-1 has been dominating the league so far, 19 wins from 21 games and 0 losses wasn't something that I was expecting at the start, especially when the game keeps telling me that due to me not using anyone in the DM slot it would leave me weak in that area of the pitch. 7 Goals conceded so far tells a different story, especially considering Liverpool don't have an amazing keeper at the start of the season, so consider me shocked when this has been happening with Karius, 15 clean sheets already is mental, how its happened I'm not too sure, and I dont know if I'll bother trying to get a new keeper in the summer if he keeps this up. 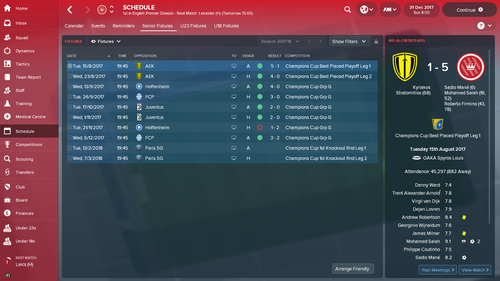 The CL gave me a group of death, and again the results are telling a different story on that side. 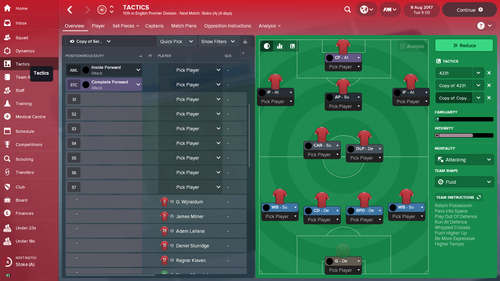 For the CL matches I swapped my attacking to standard or control to get me through the games. I didn't expect to win and top the group, and honestly I wouldn't have been surprised if we had finished third in it, it would have been disappointing but not too unexpected. PSG in the first knock out round was probably one of the better draws we could have got, but there were still weaker teams that I would have preferred to get to make sure we got to the quarter finals which is what our aim for the season. 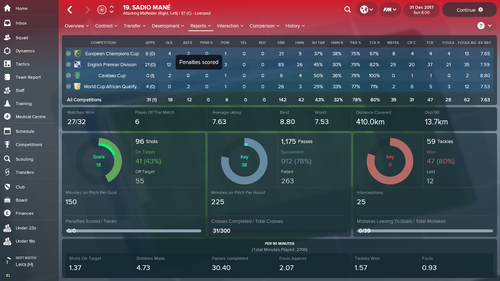 Firmino, Mane and Salah have been amazing, I posted earlier about them having 10 goals each in November so there's their stats at the end of December. They have carried me through the season so far, and I think it's going to be hard to keep them next season if someone like Barcelona come in for one of them. 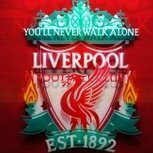 Mane has asked for a new contract which I've told him will be discussed once the season is over. I'm thinking around £150k which is what Coutinho is on, and what I gave Firmino at the start of December. If we take a look at goals scored besides the three of them it isn't that great, but I can't be too shocked by that, they pretty much play every match for me. 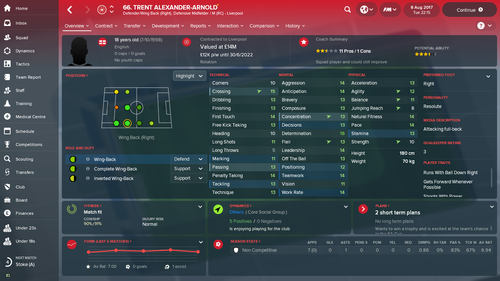 He's got the same finishing on my save, I've left him in the under 18's for my first season.